Its been done before I am sure but, I have done this a few times recently and it is tasty as. 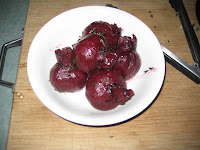 Essentially, boil/steam some root vegetables until just tender, drain, add butter, heat and flavour. This is a technique I plan to use heaps. Boil the carrots with a couple of slices of orange peel until just tender. Drain the water and allow the carrots to steam out in the pan for a minute or so. 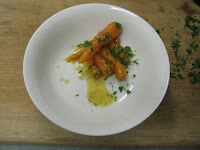 Return to the heat, add in some butter and heat until foaming, pour in some honey, salt, pepper and parsley, toss to combine then remove to a serving dish. Heaps easy, heaps tasty. Boil the beets until just tender, drain and allow to steam out for a minute or so. Add in the butter, thyme and garlic and return to a medium high heat. When fragrant add in the balsamic glaze and season with salt and pepper.